Palm oil has long been used by food and consumer product companies as an ingredient in everything from ice cream and chips to lotions and soaps. But the production of this inexpensive and versatile oil has long been blamed for causing severe environmental damage, which is why Unilever (UN, UL), maker of Lipton tea, Dove soap and Hellmann's mayonnaise, and the world's biggest buyer of palm oil, has decided to explore an alternative: oil from algae. The London-based company is expected to announce on Wednesday that it is making a multimillion-dollar investment in Solazyme, the San Francisco-based developer of algal oil, according to The Wall Street Journal. 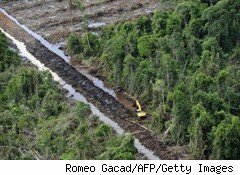 Oil palms only grow in tropical climates, so to provide land for palm plantations, tropical rainforests and peatlands in South East Asia are being torn up. A report published in 2007 by the United Nations Environment Programme acknowledges that oil palm plantations are now the leading cause of rainforest destruction in Malaysia and Indonesia. Indonesia also had the dubious honor of being named in the 2008 Guinness Book of Records as the country with fastest rate of deforestation, according to Greenpeace. In addition to rainforest destruction, palm oil has been associated with destroying the habitats of endangered animals, including orangutans; huge increases in greenhouse gas emissions; and gross human rights and labor violations. According to Greenpeace, the WWF and other organizations, our consumption of palm oil is skyrocketing: Compared to levels in 2000, demand is predicted to more than double by 2030 and to triple by 2050. While most of it ends up in food, its use in the biofuels industry is also expanding rapidly. But efforts such as the formation of the Roundtable on Sustainable Palm Oil, as well as protests at different companies, are bearing some fruit. For example, just a few days ago, Burger King (BKC) joined Nestle, Kraft (KFT) and Unilever, and stopped trading with the Sinar Mas group, a major palm oil producer that has been blamed by Greenpeace for illegally clearing rainforests. But agricultural giant Cargill is refusing to cut its ties with the Indonesian supplier. And Greenpeace says that despite the efforts of the Roundtable, forest destruction continues. Can Algal Oil Be Competitive on Price? It's not surprising then that Unilever is looking for alternatives to palm oil. Algal oil can be produced several ways: "Solazyme takes cheap, readily available plant-matter such as prairie grass, sugar cane and corn husks and feeds it in big tanks to single-cell organisms, or microalgae, that have a natural capacity to make oil. Other algae companies use photosynthesis," the Journal explains. While algal oil can be used in foods (it was recently approved as a food ingredient in the EU), soaps and lotions, as well as serve as biodiesel fuel, for now, Unilever has invested in exploring algal oil specifically as a replacement for the palm oil in Dove soap and other products. As a commodity, palm oil is subject to volatile price fluctuations. Bloomberg reported Wednesday that "Palm oil advanced to the highest level in three weeks." Algal oil could provide more price stability. It all sounds promising, but it isn't clear yet whether algal oil can be produced in sufficient quantities and at a cost that would be competitive with naturally harvested oils, the paper says, adding that companies will also likely have to go through many rounds of testing before products with algal oil are on shelves. Unilever has already spent months testing Solazyme's oil in soaps and lotions, but says it's still three to seven years from rolling out algal oil as an ingredient, according to the Journal. But its use is in line with the vision of the company's recently appointed CEO, Paul Polman, who says he's aiming to double sales while decreasing the company's environmental impact. As for Solazyme, other than selling algal oil for use in foods and cosmetics, it has also been providing algae-derived jet fuel to the U.S. Navy for testing and certification. And oil company Chevron (CVX) has invested in Solazyme too, a testament to its promise as a biodiesel source.